This is, hands down, one of my most favorite memes from Facebook. It completely describes most of us in this system. People have asked us before why we always seem to need to learn things the hard way and the answer has always been the same….. we didn’t realize there was any other way. 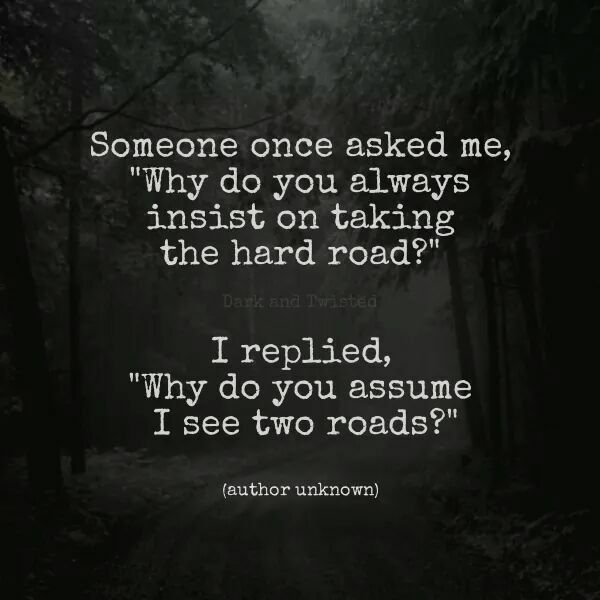 I think, in a way, the hard road/way always seems easiest to understand. We are leery of things that seem too easy. Almost like its a trap or not “real”. So, these silly girls take the hard road. Part of taking the hard road seems to be never looking at what’s right in front of you. Right in front of me is a ton of opportunity to learn new things and to do things that previously were impossible. Mom and Daddy are really supportive of whatever it is we want to try. So some of us made lists of things we would like to try to learn or do. So far that’s what I’ve got. Glee is playing now (binging on Netflix) and they are talking about Domestic Violence. I’m home alone, like usual these days, and anxiety is bad. I have brownies cooking for Mama in hopes that it makes her smile. I used a box mix because I have no idea how to bake anything from scratch, nor do I understand what ingredients would be needed. That’s why baking is on my list. Its time to switch. I’ll let you know how my list progress goes. Our mountains wish us good morning (taken 11/1/15 with the samsung S6 around 7:45am). 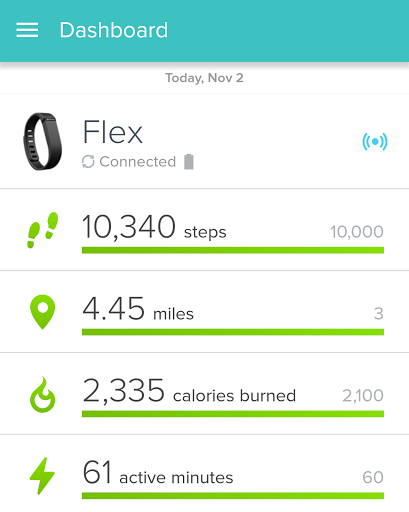 This a partial screen shot of our Fitbit Flex today (11/1/15). The negative emotions were eating us alive. We were second guessing a lot of our recent major decisions and trying to figure out how we had screwed up so badly in life. We were trying to figure out what was wrong with us and why we are always rejected and/or left behind. It was just bad. If you’ve read other posts, you know how bad things got. Everyone in this house was dealing with their own problems and adjusting to their transitions in their own way. Everyone was battling big things… and we were sick. We spent almost all of last week with a bad cold and a mild fever. That helped NOTHING at all, especially because we couldn’t safely go for our walks. We could barely make it safely across the driveway. Being down for the count last week, having to rest and not walk seemed like a great thing. 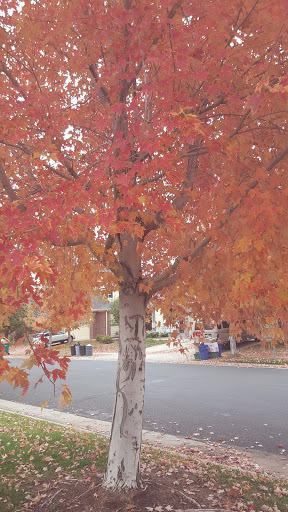 It seemed so wonderful to not ache and not deal with the arch pain in our right foot. It continued to seem like that, but our life seemed to be falling apart at the same time. We were a mess, our life felt like a huge mess. Friday morning comes around and Mom, once again, insists on a 2 mile walk. We ended up with close to 2.5 miles on Friday. 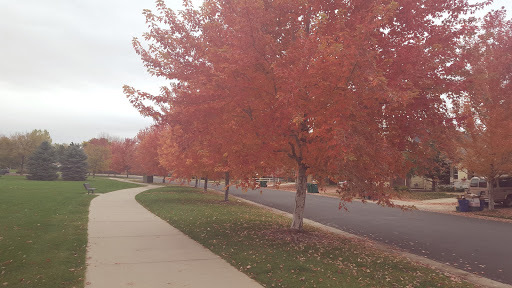 By yesterday, we realized that when we don’t walk, we miss a lot of benefits from walking. 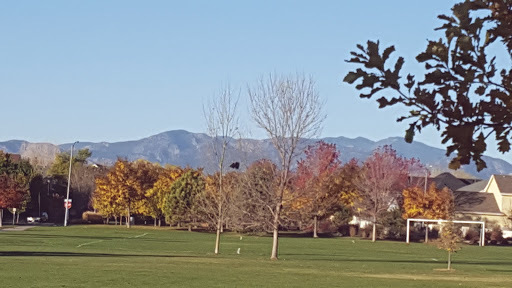 We miss our park, our mountain, and our trees. More importantly, we miss out on the good feelings that come from walking. We’ve always heard that walking releases endorphins and raises mood, blah blah blah. I can honestly tell you that the blah blah blah is real. Our mood and our life was spiraling out of control because we weren’t doing what we needed to do in order to take care of ourselves. No, we shouldn’t be walking when we’re sick but we could have tried sooner. Mom knew though. She knew how badly we relied on that, even when we didn’t. She made the choice to force us back into it knowing we didn’t feel well. That’s not to say that our problems as a family were all due to a lack of walking. God I wish it were that easy. No, we as a family have a lot of work to do in order to make everyone feel welcome, safe, and happy. But we can make it better on ourselves and, in turn on our family, by keeping up with our walking. This morning, while we were hanging out in Mama’s room watching her go through her laundry, she had us try on some pants. Almost everything she gave us to try on fit, and most of them were smaller than what we already had. She had noticed that we were struggling to keep our pants up. We noticed too, kinda, but figured we stretched them out or something. We never considered that we were ready for smaller pants. Her scale (which she only lets us use once a week) showed us today that we have lost 30.2 pounds since we moved here in August. That’s huge. It’s seriously huge and we never noticed. I spent a bit looking in the mirror today, and I really can’t see it. The neighbor sees it. Aunt Leslie says she sees it in pictures. Mom says she sees it. We just don’t. What we do see: Our hair is growing back thicker and in much better shape, our nails are getting healthier, our blood sugar is almost always close to perfect and a blood sugar level of 90 feels great. When we first moved here 130 triggered a low reaction. Our average blood sugar sat around 300 and refused to budge. Today, after completing 3 miles and seeing the scale, the clothes fitting differently, and spending some not emotional, perfectly normal time with Mama, I feel good. Not only do I feel good, I feel hopeful, strong, and I feel a weird sort of peace. I don’t really feel safe yet, that I think will come in time. I think I need to work on not pushing myself to feel safe. Pushing this system to feel something we aren’t ready for or can’t seem to grasp always seems to lead to disaster. I think I’m going to do my best to keep my sisters and I looking ahead and I’m going to keep building my support system. I love my family and I won’t give up.